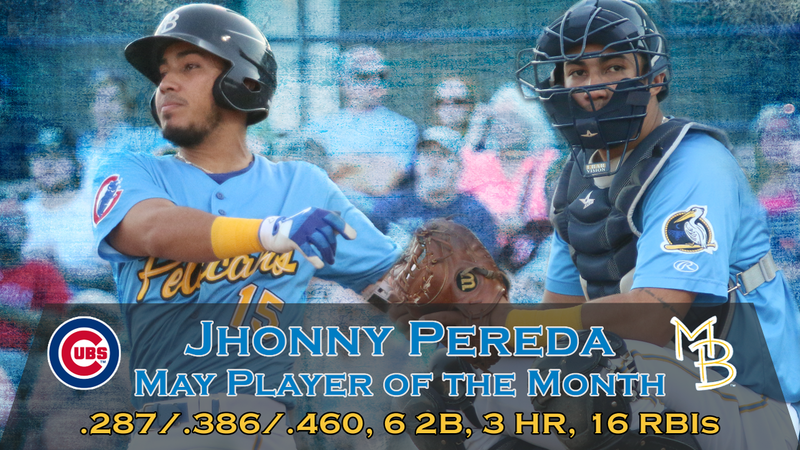 MYRTLE BEACH, S.C. (June 7, 2018) - Myrtle Beach Pelicans catcher Jhonny Pereda has been named the Chicago Cubs' Minor League Player of the Month for May, the organization announced Thursday. A native of San Sebastian in Venezuela, Pereda batted .287/.386/.460 (.846 OPS) in 23 games in May, smashing six doubles and three home runs while posting 16 RBIs. The 22-year-old also registered 14 walks against only 18 strikeouts, reaching safely in 20 of the month's 23 games. A career .238/.323/.302 (.625 OPS) hitter in 266 games across five seasons entering the 2018 campaign, Pereda is slashing .297/.370/.413 (.783 OPS) with six doubles, one triple, four home runs and 30 RBIs in 47 contests with Myrtle Beach. His batting average currently places seventh in the Carolina League. Behind a contact-oriented approach, Pereda's 122 wRC+ is the best of any Carolina League catcher and ranks 17th overall in the circuit. His 15.0 percent strikeout rate is the 10th-lowest in the league, and of Pereda's batted balls, 27.7 percent have been line drives, the fifth-best mark in the circuit. Only two players in the Carolina League have hit to the opposite field more than Pereda (40.6 percent). Originally signed by the Cubs as a non-drafted free agent in 2013, Pereda is the second Pelican to earn a monthly honor in 2018. Right-hander Matt Swarmer , who was promoted from Myrtle Beach to Double-A Tennessee on Tuesday, earned the organization's Minor League Pitcher of the Month award for April.